Description Apply RMO or trim statics corrections to a volume. 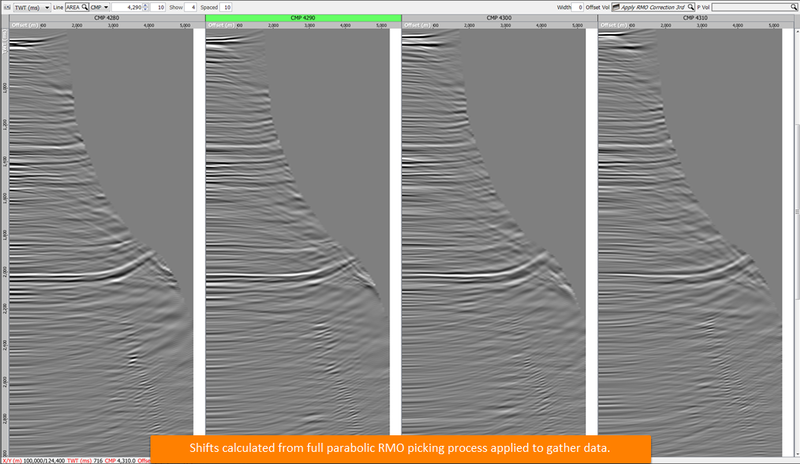 In the Imaging tab, pick RMO (parabolic or non-parabolic) on volumes and/or horizons. You can create multiple separate sets of picks, if necessary, with different parameters. It is important that pick spacing and maximum moveout be managed, to avoid picks overlapping in time/depth. Use this process in the Calculate Shifts mode to create a volume of shifts. To make realistic updates, this should be somewhat sparse. 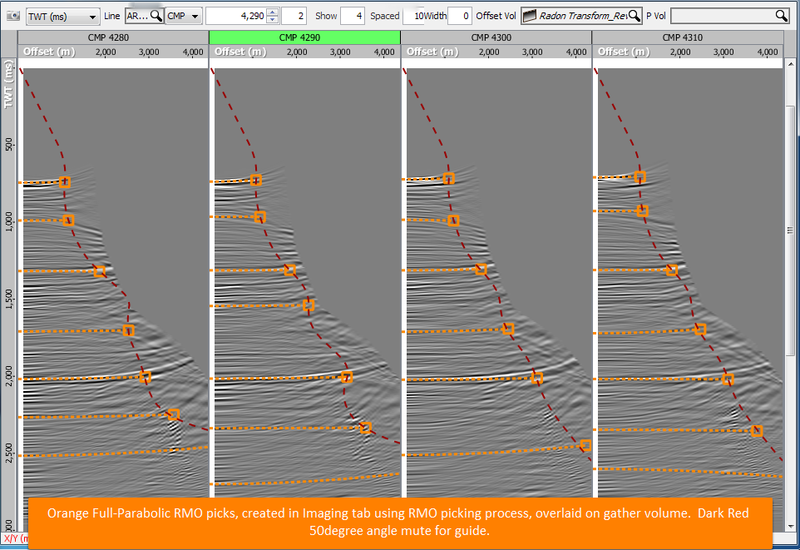 We recommend starting with an IL/CL or CMP spacing of 50m, offset spacing of 500m, vertical sampling of 10ms or 10m. Use the Volume Smoothing process on the volume of shifts (see Volume Smoothing). The results should be very smooth — we recommend starting at 500m to 1000m laterally, and 100ms/100m vertically. Use this process in the Apply shifts mode to update the seismic. This is the only portion that can currently run in a workflow. Turn all volumes off except RMO correction and original volume. 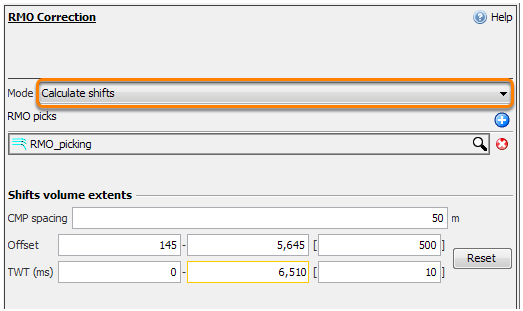 Use Insight's HotKey PageUp/PageDown, or middle mouse scroll between the two volumes for QC. Select RMO Correction and type a name for the process. In the Details Panel, at Mode, select Calculate shifts. Click the Add icon to add any number of RMO Picking items from the Imaging tab. You can mix any number and type of picks. However, they must all be in the vertical domain of the seismic volume to which you will eventually apply the shifts (i.e. all TWT or all TVD). IL/CL (or CMP) spacing — Note that this is specified as a distance, not a trace count. Offset — Min/Max/Increment sequence. We recommend 500m spacing as a starting point. TWT/TVD — Min/Max/Increment sequence. We recommend 10ms/10m as a starting point. In the Details Panel, select Apply shifts as the Mode. At Volume, select the seismic volume to be corrected. At Shifts volume, select the volume of shifts created by the Calculate shifts mode. In a standard workflow, this should be quite smooth!